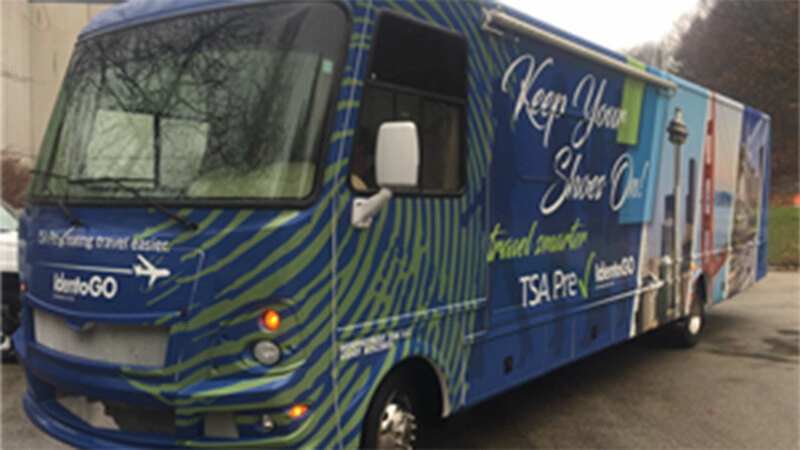 A mobile TSA PreCheck enrollment center will open this week in Schaumburg to enroll travelers in the program. Starting Wednesday through July 7, travelers can sign-up for the program. PreCheck enrollees are no longer required to remove shoes, belts or light jackets, and laptops and liquids can stay in carry-ons bags during airport security screening. The mobile center is in the back of a custom RV, which has been traveling across the country. To enroll, attendees must bring a government-issued photo ID with proof of U.S. Citizenship (i.e. a passport or birth certificate) and complete a 10-minute fingerprinting process. Once approved, travelers receive a KTN (Known Traveler Number) and have access to PreCheck expedited airport security lines for five-years at a cost of $85 ($17 per year). For a full list of acceptable documentation for enrollment, click here. Walk-ins are welcome, but appointments take priority and are highly encouraged. To schedule an appointment in advance, click here. The mobile enrollment center will be at 1375 E. Woodfield Rd., Schaumburg. Wed., June 28: 10 a.m. - 5 p.m.
Thurs. - Fri., June 29 - 30: 9 a.m. - 5 p.m.
Mon. - Thurs., July 3 - July 6: 9 a.m. - 5 p.m.
Fri., July 7: 9 a.m. - 3 p.m. The events are organized by IdentoGo. For more information, visit: IdentoGO.com/RV.